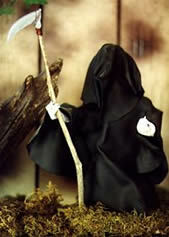 Beckoning to all those who would dare to look, -but don't!- this reaper is always ready for company. Watch Out! 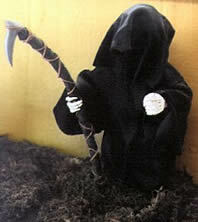 Our reaper wants you! Not quite as subtle as his counterpart, as his finger burns his mark on your very soul. 10-12" tall on a 7-1/2" base? 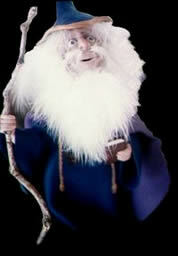 Always with his faithful friend, this wise old sage sees all, hears all, and knows all. 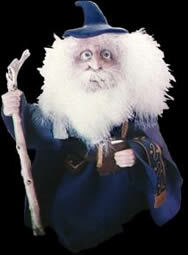 Ready to embark on his next mystical journey, with his pouch of magical ingredients, spell book and altar cloth. Make his next destination yours! 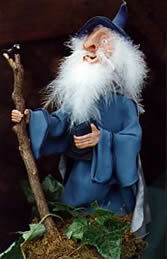 This kindly old fellow is ready to tell an ancient tale of dragons, castles and fantastical days gone by.